Combine the chicken stock and rice in a medium saucepan and bring to the boil. Turn down the heat and simmer with the lid on for about 45 minutes or until the husks have split. Taste the rice, it should be tender but still have a bit of bite to it. Drain the rice and then cool by spreading on a baking tray. Whilst the rice is cooking, preheat the oven to 180 °C. Put the pumpkin seeds and pine nuts on a baking tray and toast them for 5–10 minutes until they are golden brown. Cool. To make your vinaigrette, in a small bowl whisk the olive oil, orange zest, orange juice, maple syrup, apple cider vinegar and mustard. In a bowl, mix together the wild rice with the pumpkin seeds, pine nuts, spring onions, chives, cranberries and the vinaigrette and serve. 7 members have added this recipe to their cookbook. 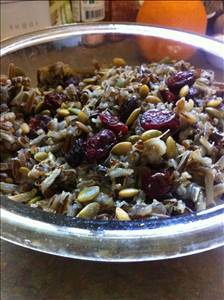 There are 242 calories in 1 serving of Native American Wild Rice Salad. Calorie Breakdown: 37% fat, 55% carbs, 9% prot.